In May 1860 delegates to the Republican National Convention abandoned front-runner William Henry Seward to choose Abraham Lincoln as their presidential nominee. 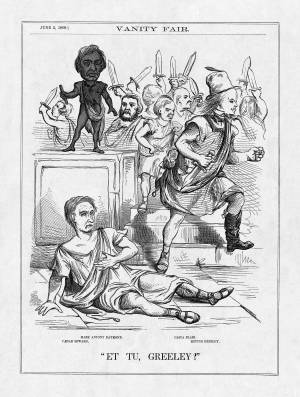 In this cartoon, Vanity Fair compares that turn of events to Julius Caesar’s assassination in the Roman Senate (likely relying on Shakespeare’s interpretation). Seward, as Caesar, lies dying on the floor, having been stabbed by New York Tribune editor Horace Greeley in the guise of Brutus. The artist depicts New York Times editor Henry Raymond as Mark Antony (who came to power after Caesar) and Francis Blair Sr., editor of the Congressional Record, as Casca. Lincoln is portrayed as a black man. Greeley wears one work-boot like the pair worn by Lincoln in a later Vanity Fair cartoon ("Three to One…," September 1, 1860).